Gaze into the Black Mirror, you won't be able to look away! Only a short time ago, Darren Michaels was a quiet store clerk in a sleepy New England town. Now in Willow Creek, England, a tormented Darren barely reacts as police handcuffs are closed on his wrists. All the evidence points to him, and the police have arrested Darren as their primary suspect in a fatal crime. He’s subjected to extensive questioning, but Darren is numb to the events occurring around him, and has withdrawn into a deep emptiness. Then after several weeks of incarceration, Darren is unexplainably released. 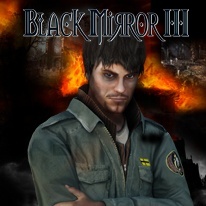 Return to face the dark forces that haunt the ominous Black Mirror Castle as you search for the secrets that lie behind the tangled web of haunting riddles, mysterious secrets and dark characters. Alternate between two playable characters, as you explore over 120 highly detailed and atmospheric locations, and interact with over 50 characters in your quest for redemption.